It’s an understatement to say that 2018 was a year of blockbuster data breaches: Facebook, Marriott, Ticketmaster and British Airways, to name just a few. As mega-breaches have become the norm, the crescendo of clamor can no longer be ignored; the reality of the true state of threats (immense) and companies’ preparedness (inconsistent, at best) is setting in. Thus, a couple of weeks from now we’ll ring in 2019, the Year of Cyber Insecurity: 52 weeks in which companies of all sizes and industries will experience a new level of fear – and in some cases panic – in realizing their vulnerability to data breaches, hacking and other cybercrimes. The good news is that 2019 will also provide a tipping point: these same organizations will be shocked into taking a more clear-eyed assessment of their cyber security posture, and strong actions to improve their cyber defenses. Here are three ways they’ll work to cure their cyber insecurity. By getting a free Cyber Risk Score subscription and tracking their individual score against the quarterly ABC, organizations in the U.S. can, for the first time, get an empirical reality check on the efficacy of their cyber defences — and receive clear direction on areas to improve. That’s the best way to deal with cyber insecurity. I’ve long thought that securing services through biometric credentials is, at best, a flawed notion. I still do. In my predictions blog for 2017 I wrote, “Biometric security data may become the biggest security vulnerability of all.” My 2018 predictions blog forecast, “We’ll See Our First Biometrics Hack in 2018.” We did, when cyber criminals breached India’s Aadhaar identity database big-time in 2018, which has led to some tragic outcomes. Biometrics are nothing more than the stored digital interpretation of a biological feature, which is then associated with your account credentials. Those digital files can be spoofed, stolen or simply rearranged to point to a digital identity other than your own. Biometrics are neither fool-proof nor fraud-proof. And when someone replaces the digital interpretation of your retina with their own, and does a sufficient job covering their tracks, good luck proving that you are really you! The honeymoon of confidence in biometrics is undeserved, and it won’t last. At the end of the day, cyber security is really a people problem. We make mistakes, we fail to follow policies, we overcommit resources, understaff projects, and we sometimes put people into jobs they are not ready for. 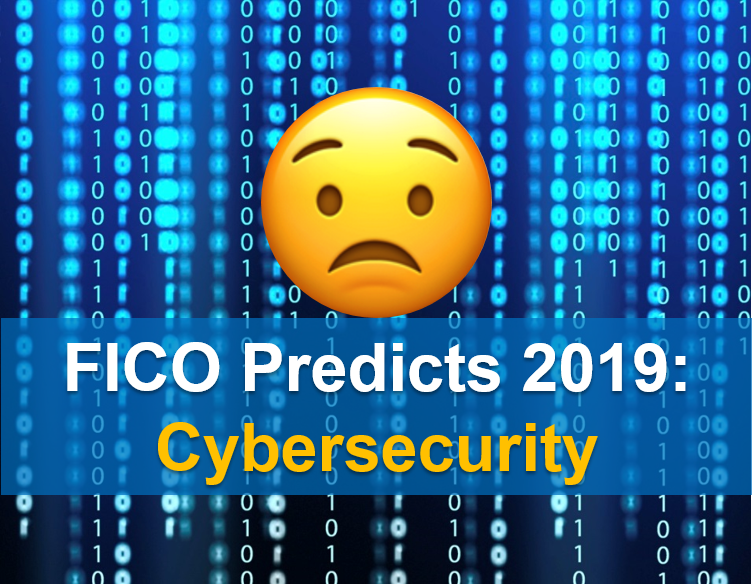 In our research around cyber risk quantification, FICO has learned conclusively that the most predictive features in modeling future cyber outcomes are behavioral, not conditional. In other words, how and how well you manage your network is more correlated with breach outcomes than the presence of specific vulnerabilities. My point here is that companies need to focus at least as much on training, awareness, policy, and policy adherence as they do on technology and infrastructure. That’s a great New Year’s resolution for everyone. Best wishes for a cyber-safe 2019, and a cure for your cyber insecurity. Follow me on Twitter @dougclare to keep up with FICO’s latest cyber developments. Cheers!